Serving pet owners in Seattle, Washington since 2002, we offer a wide array of professional services that are tailored to your specific needs. This personalized care reliably continues your pet’s routine while allowing you to go to work or on vacation worry-free. Your pet will be treated not only with highly experienced care, but also with a strong personal love and respect of all animals. Voted Seattle’s Best Pet Sitter! 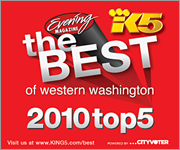 All Seasons Pet Care finished in TOP TWO for Western Washington in King 5’s “2010 Best of Western WA” contest. ASPC also has an “A” rating on Angie’s List.